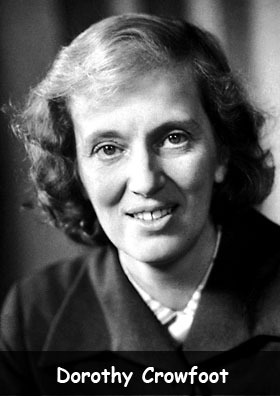 Dorothy Crowfoot Hodgkin is the only British woman to win a Nobel Prize for science. Dorothy is credited with the mapping of the structures of penicillin, Vitamin B12 and insulin. Dorothy Crowfoot was born on May 12, 1910 in Cairo, Egypt. Eldest of four sisters born to John and Grace (Hood) Crowfoot, she spent the early part of her life travelling to different places in the Middle East and Africa with her parents who were British. Her father, John Crowfoot, was a British archaeologist and scholar and served in the Egyptian Ministry of Education, then under the control of the British. Her mother, Grace Hood Crowfoot (born Hood), encouraged her to study crystals for which Hodgkin had developed interest early in her life. When was Dorothy Hodgkin awarded Nobel Prize? Dorothy made history in 1964 when she became the first British woman to receive the Nobel Prize in science. She won the prestigious honor for Chemistry for her research on penicillin and vitamin B12. She was honoured with the Order of Merit, one of Britain’s highest awards. Dorothy also bagged two awards from the Royal Society: the Royal Medal and the Copley Medal. Where did Dorothy Hodgkin get her education? Dorothy had a bright mind and excelled at academics. Dorothy Crowfoot Hodgkin attended Sir John Leman Grammar School in Beccles, Suffolk in England between 1921 and 1928. She was one of only two girls who were enrolled in science stream at the school at the time. In 1928, Dorothy joined Somerville College at Oxford University from where she received her Bachelor’s Degree in chemistry in 1932. After graduation, she began to assist the famous British crystallographer John Desmond Bernal at the University of Cambridge. In 1934, Dorothy returned to Somerville, one of Oxford’s few colleges for women, to pursue her doctoral studies and teach. She taught at the college until her retirement in 1977. Dorothy Crowfoot Hodgkin was one of the first scientists in England to make use of computers in her research. One of the most influential women of the previous century, Dorothy took an active interest in politics and was a teacher of Margaret Thatcher, the first and only British Prime Minister, at Somerville College in Oxford. Dorothy traveled to different countries like China and Vietnam to promote world peace. In 1947, Dorothy was elected Fellow of the Royal Society (FRS), the leading scientific organization in the United Kingdom. From 1975 to 1988 she served as president of the Pugwash. An organization of the scientists from around the world, Pugwash worked for nuclear disarmament. In 1937, Dorothy married Thomas L. Hodgkin, who was a historian by profession. They had three children. She was a soft spoken person. Dorothy died of a stroke on July 29, 1994, at an age of 84 in Shipston-on-Stour, England. Declan, Tobin. " Dorothy Crowfoot Hodgkin Facts for Kids ." Easy Science for Kids, Apr 2019. Web. 25 Apr 2019. < https://easyscienceforkids.com/dorothy-crowfoot-hodgkin-biography-discoveries/ >.